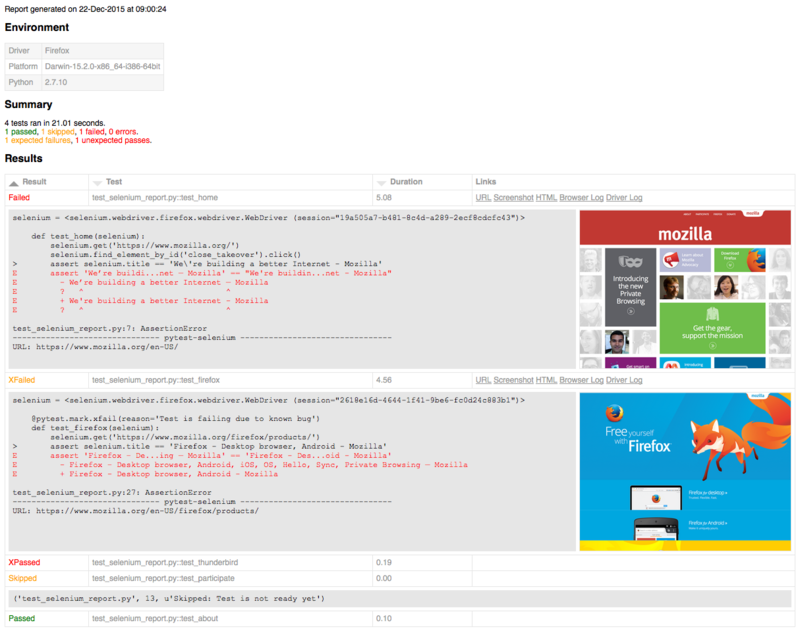 pytest-html is a plugin for pytest that generates a HTML report for the test results. Note that ANSI code support depends on the ansi2html package. Due to the use of a less permissive license, this package is not included as a dependency. If you have this package installed, then ANSI codes will be converted to HTML in your report. Images added as files or links are going to be linked as external resources, meaning that the standalone report HTML-file may not display these images as expected. The plugin will issue a warning when adding files or links to the standalone report. Custom CSS (Cascasding Style Sheets) can be passed on the command line using the --css option. These will be applied in the order specified, and can be used to change the appearance of the report. The generated table will be sorted alphabetically unless the metadata is a collections.OrderedDict. Note: When adding an image from file, the path can be either absolute or relative. Note: When using --self-contained-html, images added as files or links may not work as expected, see section Creating a self-contained report for more info. By default, all rows in the Results table will be expanded except those that have Passed. This behavior can be customized with a query parameter: ?collapsed=Passed,XFailed,Skipped. Fork the repository and submit PRs with bug fixes and enhancements, contributions are very welcome.